The Who at Halftime: Yay or Nay? Okay, so what did everybody think of the Who at the Superbowl Halftime show last night? I think they did an alright job, all things considered. The performance started out a little shaky. Roger Daltrey has clearly aged and his voice sounds it. At the beginning of the show, his raspy and often out of tune notes pierced my brain, but just about midway through ‘Teenage Wastland,’ he seemed to finally warm up a bit and sparked some life back into those old songs. 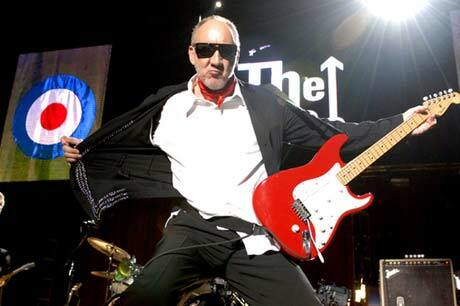 As for Pete Townshend, it was exciting to see him try to relive his past by doing his trademark windmill strumming, but I secretly feared for his shoulder. I bet that’s sore today. Townshend’s voice has held up better than Daltrey’s by far, but of course, his age still shown through. Zak Starkey, Ringo Starr’s son, did a fantastic job rocking the drums. He was most definitely the most energetic performer of the night. I guess it might be kind of difficult to lend that title to the aging members of the Who. It was interesting that the cameras did not, but for one time, take the shot off Daltrey, Townshend, and Starkey. Obviously, they were the most famous out of the bunch, but what a way to kick the other musicians out of the picture. It wasn’t right and I wanted to see more of the whole stage setup. But the true thing that I think saved this performance were the lights and visual effects. Without the bright lasers whipping around the performers and computerized images of Townshend strumming his guitar, I don’t think this medley would have gone over very well. Either way you look at it, I have to give them credit. They have not played together in quite a long time, still had the gusto to come out on stage and rock as best they could, and even did the show for free. That’s right, they didn’t get paid a cent for the performance. Kudos to the Who, but it’s definitely time to retire those chops.